Exceptional big bass sound, but super compact size (2.6" tall/2.5" in diameter/ 6.6cm tall/6.35cm in diameter) is perfect for use at home or while traveling. 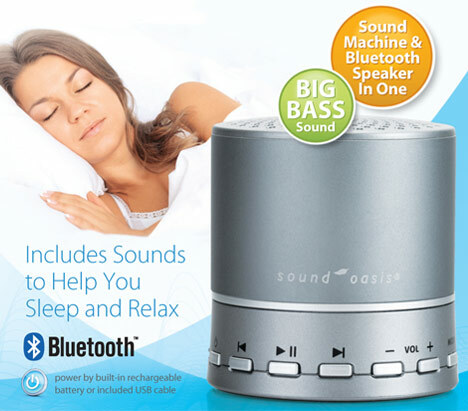 Stream new sounds or music from any bluetooth enabled device (iPhone/ iPod/iPad/MP3) for exceptional versatility. 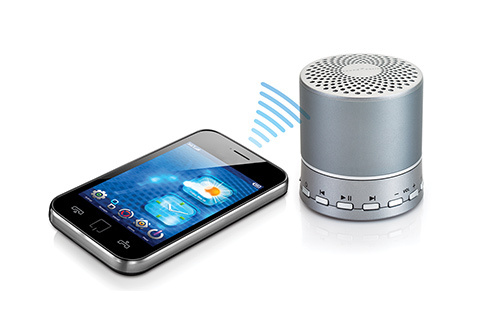 Insert a new micro SD card with Sound Oasis sounds for unlimited sound library expansion. 30'/10 m Bluetooth wireless range. 1. Turn on your BST-100 by pressing and holding down the BST-100 POWER button for 3 seconds. 2. Your BST-100 will enter the Bluetooth streaming mode by default. The Bluetooth LED on your BST-100 will blink to show that it is discoverable. 3. On your Bluetooth enabled device, turn Bluetooth on, locate the Bluetooth device list and select the device named BST-100. Pair your BST-100 with your Bluetooth enabled device. 4. The Bluetooth LED will light up on your BST-100 and you will hear a Bluetooth pairing mode “blip" to indicate that you are in the Bluetooth streaming mode. 5. Press play on your Bluetooth device to play the streamed music/sound.